The official conference travel agency is Viajes Gandia. Please use this hotel reservation form to book accommodation. The following hotels have been pre-booked for the conference. Rates are valid for reservations made before 15 August 2009. There is a "hotel location map" in the downloads section of the main menu. Located 500 meters away from the beach and approx. 3km far from the University Campus. 265 rooms. Restaurant, swimming pool, spa & casino. Located 150 meters from the beach and approx. 500 meters from the University Campus. 179 rooms, restaurant and bar, air-conditioning, satellite TV, telephone, safe deposit. Located 2.5km away from the beach and approx. 1km from the University Campus. Located 100 meters away from the sea and 600m from the University Campus. Swimming-pool & restaurant. Located in front of the Yacht Club. Approx. 2km away from the University Campus. 76 rooms with en-suite facilities, telephone, air conditioning, satellite TV & safe deposit. Located 125 meters from the beach and approx. 3 km from the University Campus. 60 rooms, swimming-pool, bar, air-conditioning, TV, safe-deposit. Located 150 meters from the beach and approx. 3 km from the University Campus. 126 rooms, swimming-pool, bar, air-conditioning, TV, safe-deposit. Located 300 meters from the beach and approx. 1km from the University Campus. En-suite facilities, air-conditioning, TV, telephone. 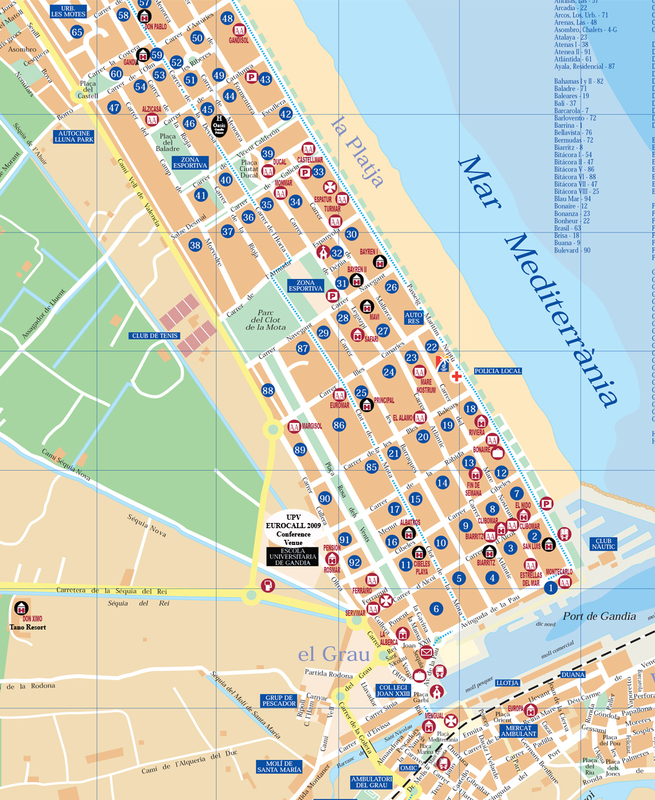 Located in Gandia town. Address: Duque Carlos de Borja 34, 46701 Gandia.